Thursday saw the City’s great and good come together once again to raise a glass and funds for those who put their lives on the line for us. A little matter of Black Cab demonstration nearby was not going to deter those who had secured their ticket and Guildhall played host to 400. They enjoyed a canapé and caviar reception with Gusbourne sparkling wine, sponsored by BaxterStorey and hosted by Monica Galetti, followed by a four-course banquet created by the Birley Clubs, featuring signature dishes from Harry’s Bar, George, Mark’s Club and Annabel’s. City guests were joined by veterans from conflicts including WWII Stalag Luft III PoW Charles Clarke and “Guinea Pig Club” member Sandy Saunders, pilot and beneficiary of what was then pioneering plastic surgery treatment for burns injuries; through to current day veterans – and some canine partners, who proved irresistible to reporter Kate Adie. The evening’s host was Cassidy Little, Afghan veteran and amputee who along with a semi-disrobed Andy Pryce-Dyer took the audience through a graphic description of the potential impact on the body from an encounter with an Improvised Explosive Device. While delivered in a light-hearted manner, the gravity of the message was not lost. Key-note speaker General Sir Peter Wall encouraged all to support the five beneficiary charities and thanked the City for its continued commitment to the Armed Forces Community. This year’s charities are: The Royal British Legion; The Royal Navy and Royal Marines Children’s Fund; SkillForce; Combat Stress; and The Soldiering On Awards. Lucky auction winners bagged some unique transport options, including a Spitfire flight, a miniature Audi car and the opportunity to be a Tube driver for the day. The night was rounded off by an after-party at Annabel’s. 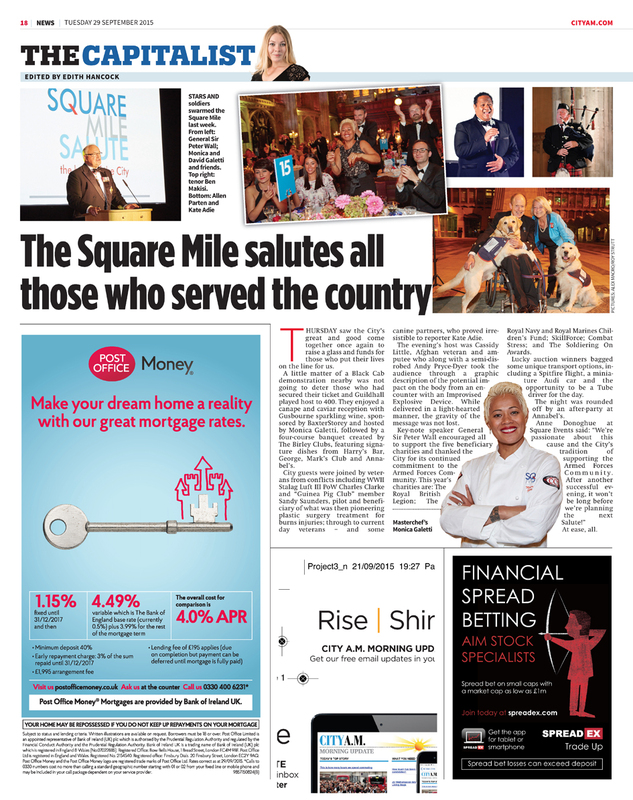 Anne Donoghue at Square Events said: We’re passionate about this cause and the City’s tradition of supporting the Armed Forces Community. After another successful evening, it won’t be long before we’re planning the next Salute!” At ease, all.